LinkedIn is the social networking site for lawyers – despite Thompson Reuter’s best, and entirely useless, efforts. More attorneys are active on LinkedIn than on any other social network, and nearly 100% of law firms have a presence – no other social network comes close. And unlike your local bar association, LinkedIn has plaintiff’s lawyers and insurance defense lawyers, white collar criminal defense attorneys and your local DA. And judges! (But be careful!) The opportunity to establish a powerful network is immense, if you know how to use the LinkedIn tools available. Six incredibly powerful LinkedIn tools exist right under your nose. You’ve been ignoring them. It’s time to take a look at the Relationship Tab. Open up one of your contacts on LinkedIn, preferably one you you don’t mind knowing that you looked at their profile. (For this, sadly, you have to be on your desktop – no mobile option as of yet) Right below your contact’s photo, you’ll see a separate box with two tabs on it: Relationship and Contact Info. It will default to the Relationship Tab. Despite it’s fairly understated look, this tab contains several incredibly useful tools to help supercharge your networking. The information in each contact’s Relationship Tab is visible only to you, so don’t worry about what you put in there (unless you don’t follow my password advice, that is). The information is also unique to each contact, so you don’t have to worry about mixing up your contacts. So how can these LinkedIn tools help your networking? Let’s be honest, we all look at this and laugh at the idea that this information would really be useful. I know I did. When, I thought, am I really going to need to know the exact date of when I connected with someone? Then it hit me. It doesn’t matter for the 50-100 people I knew well prior to connecting on LinkedIn, for the other 500+? How and why did you connect? Was it immediately after an important conference or a big mediation? For anyone beyond that magical 150th connection, any reminder is helpful! It seems lately that it’s becoming more and more popular to send new connections messages over the LinkedIn Messenger. Sometimes I find this to be a little bit obnoxious, but as long as they’re not using a ridiculous, poorly drafted form message, I don’t usually mind. Then there is the rare occasion where new information, well written and targeted, actually gets my attention. New connections have, with the right message, gotten me to review several new products I wouldn’t have otherwise seen, so it’s not all bad! Plus, there’s not really a better way to contact a colleague whose email address has changed or magically vanished from your contacts file! Click on the “See More” link to reveal the full list of conversations you’ve had. Your most recent message will be on the top, and clicking on that message will open up the full details in a pop up window. This can be incredibly helpful for remembering where a conversation left off, or if you’re trying to remember how recently you sent your last message. This might be the single most useful LinkedIn tool on the Relationship Tab. It’s completely free-form, no specific drop-down boxes or buttons, just a text box. It can be personal or professional, and it’s completely private. Anything that freaking helps, about anything! There’s a reason that sales people always have contact information available at the press of a button. Say you were calling one of your contacts, thinking about referring some cases their way. Would you rather spend the first five minutes of the conversation refreshing the guy on who you are, or would you prefer being asked about your kids as soon as he finds out it’s you. Do you really care how he knew the information so quickly? Even if you do, you’ll never know how he knew it. The same is true for your connection notes. 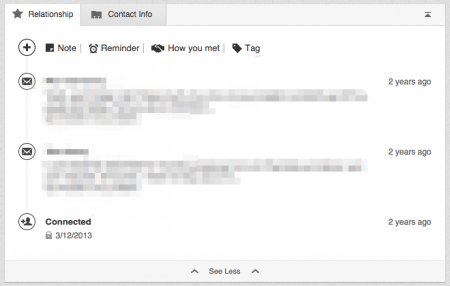 Another incredibly useful tool hiding in plain sight is the Reminders tool. It is what it says: here is where you set reminders. All you need to do is fill in the text box and the time of the reminder (1 day, 1 week, or 1 month – with an option for recurring reminders), and hit Save. When the designated time arrives, you’ll receive an email notification and a link to the contact’s profile page. Access the reminder details, and once complete, check off the reminder and it’s cleared from your activity list (permanently, so if you need to remember it, write it down somewhere!). Pending reminders will be listed under your Connections tab. Remind yourself to send a follow-up email, to schedule regular lunches with a great referral source, or to call one of your experts. With an open text field, your reminder can take any form you want, so there’s no limit as to the reason for or topic of your reminder. Provided you’re not stalking them. 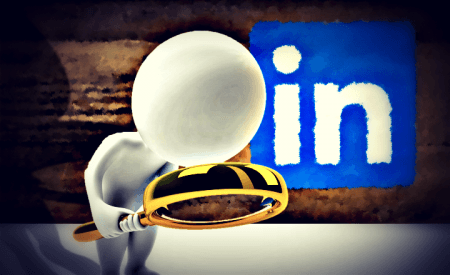 If you handle your LinkedIn invitations properly, and ignore that crap advice about only connecting with people you know, you probably have numerous connections that are of varying levels of importance. Some are people you wanted to be nice to, so you accepted their invite. Some hold the future of your law firm, your children’s education, and the continued superiority of the human race in their hands. On LinkedIn, unless you’re close, it’s not off-the-bat easy to tell the difference. So as you expand your network, take the time to record how you met your new connection. It’ll only take a minute, and it’s way better than doing it the way I did – over one depressingly repetitive Saturday afternoon. If you’re looking for a shortcut, why not copy and paste any personalized connection requests? That way you’ll know exactly why he or she decided to connect. Remember – those initial connection messages are not transferred to the messages list! Were you introduced by another one of your connections? Include that information as well! If they’re also a LinkedIn connection, just start typing their name, and LinkedIn will insert a link to their profile. 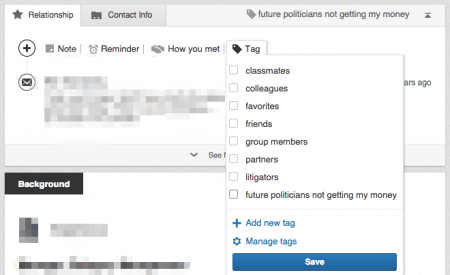 If you follow this blog, you may already know how big a fan I am of tags. If you don’t use them to organize your documents, I feel sorry for you. They’re an amazing tool. Guess what – they work just as well for your contacts. As I discussed above, it’s getting to the point where we have far too many contacts to keep up. (Again, remember the 150 number from above? It’s not a number I picked at random.) So create categories for your connections. They don’t have to be exclusive, because you can tag one contact into several different categories. Your law school friend can also be in your “Litigators” category, and they can also be in your “Mediators” category. If they’re a unique type of friend, they can also fit into the “Future Politicians Not Getting My Donation” category. Don’t lie, you have them too.